Purple Hangouts is a libpurple plugin which adds support for the proprietary protocol that Google uses for its Hangouts service. Using it, you can get extra Google Hangouts features that aren't available through the XMPP interface in Pidgin and other applications that use libpurple. Among the extra features (compared to using XMPP) provided by Purple Hangouts are group chats, self messages, synchronized history between devices and SMS support via Google Voice. You can see a feature comparison between using Google Hangouts in Pidgin via XMPP and using the Purple Hangouts plugin, HERE. Then enter your username and click "Add". For authentication, Purple Hangouts uses Google OAuth, and upon adding your username in the Pidgin Hangouts settings and clicking "Add", an authentication box should pop up and a new page should open in your default web browser, asking you to authorize the application with Google. Tip: install Unicode Emoji for Pidgin. For a complete experience, I recommend installing Unicode emoji for Pidgin. Download unicode-emoji from HERE (click "Download ZIP" in the top right) and extract the downloaded archive in the ~/.purple/smileys/ folder (if it doesn't exist, create it). Purple Hangouts is not considered stable yet, so you'll find missing or incomplete features and bugs. Report any bugs you may encounter @ BitBucket. 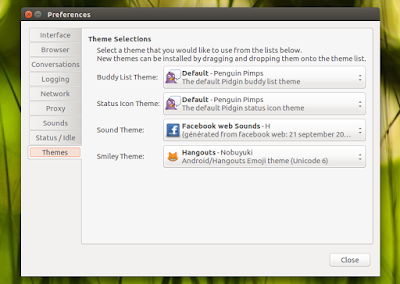 If you don't want to add the PPA, grab the deb files from HERE (you'll need both purple-hangouts and pidgin-hangouts). Purple Hangouts is also available in a Fedora Copr repository. 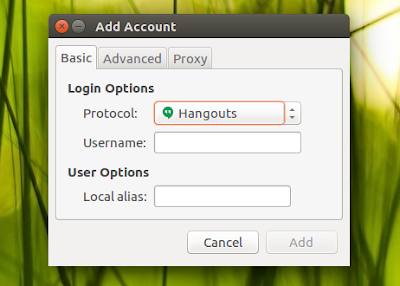 Arch Linux users can install Purple Hangouts via AUR. See the Purple Hangouts BitBucket page for source and installation instructions for other Linux distributions as well as Windows downloads. Thanks to Frederik F for the tip!